207 Commodore Dr , Jupiter, FL 33477 | Sotheby's International Realty, Inc. 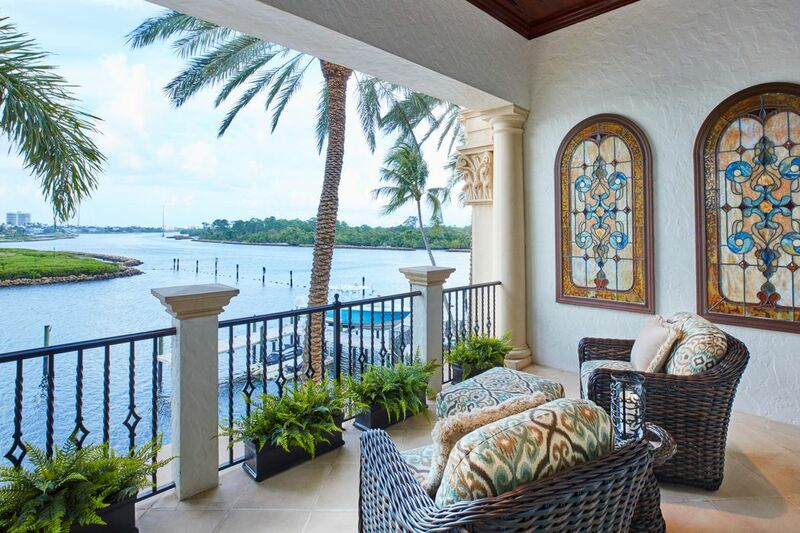 Located in the prestigious gated community of Admirals Cove, this stunning Mediterranean style home is situated on 225’ of water frontage on a direct Intracoastal point lot with panoramic views of the waterway. Offering the ultimate in luxury and privacy, the property boasts exquisite details throughout and provides the best of indoor and outdoor living. 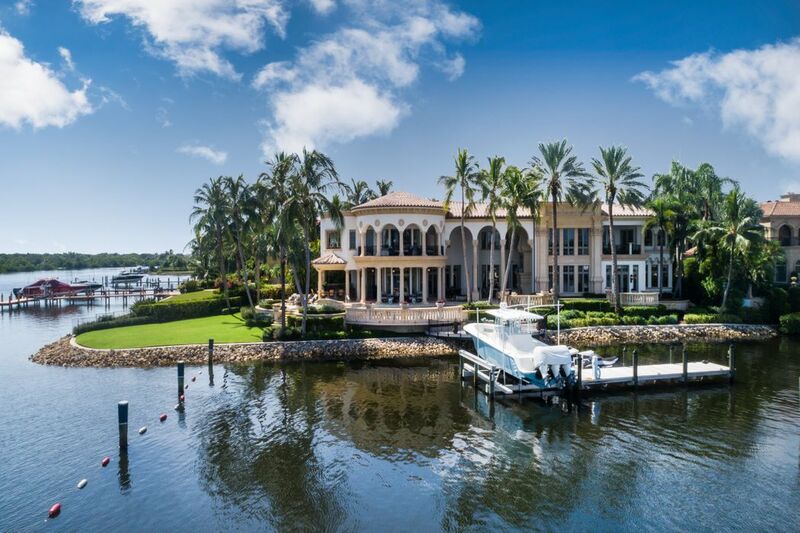 Built in 2000, the 15,619 +/- total square foot residence has 5 bedrooms, 7 full baths and 1 half bath with spacious outdoor loggias, a waterfront pool, and a dock located on a protected canal. 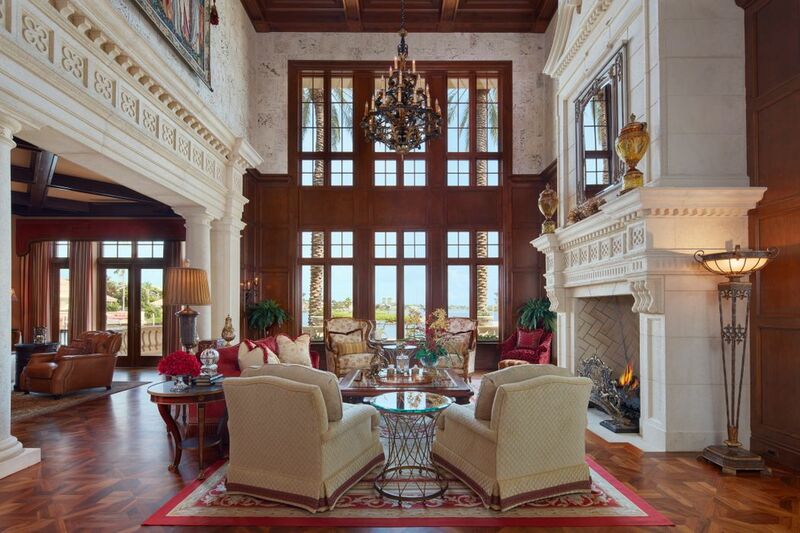 The formal living room showcases a large stone fireplace, a wall of windows facing the water, natural walnut wood floors, coquina and wood paneling, and a coffered pecky cypress ceiling. The upstairs balcony looks down into the living room providing natural light and water views in the second floor stair hall. 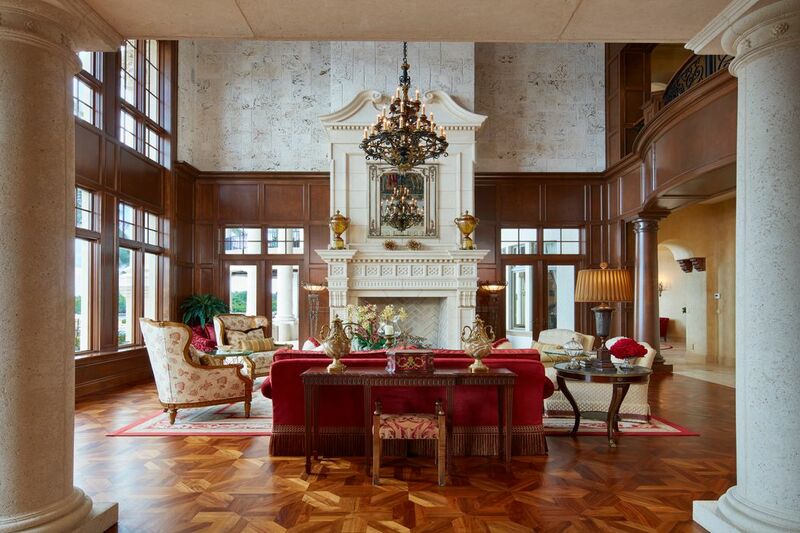 Stone columns separate the formal living room from the Club room. 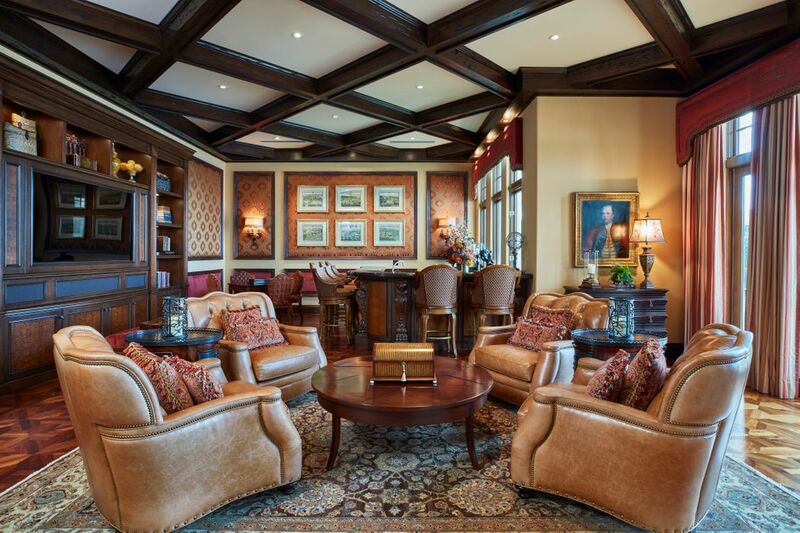 The Club room, overlooks the water, and is the perfect gathering space with a custom bar, a beautiful built-in with a large television and surround sound system, automatic sun shades and doors leading out to the waterfront terrace. 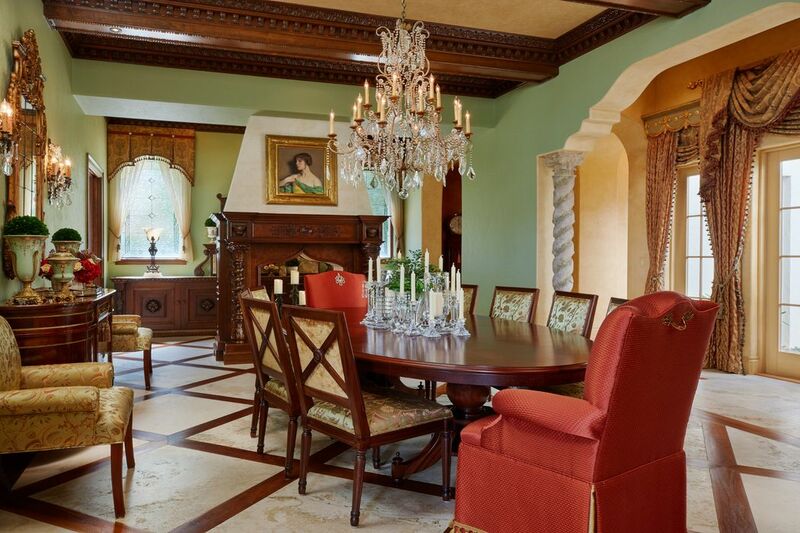 The dining room offers wood and travertine integrated floors, intricate moldings, high ceilings, and a wine closet. 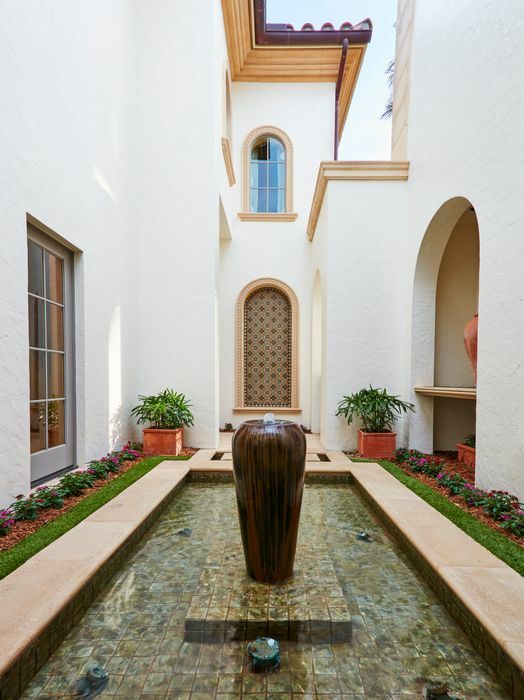 Doors from the dining room lead out to a private fountain feature with a hand painted tile wall. 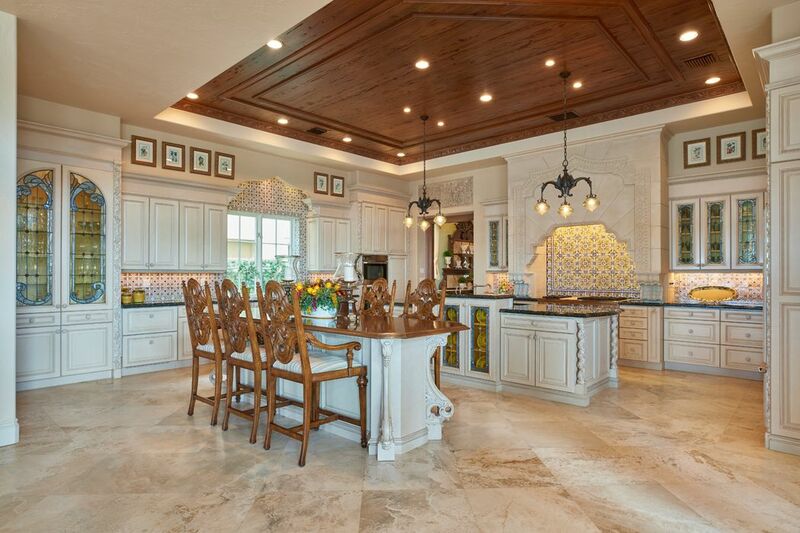 The kitchen, with granite counter tops, a painted tile back splash, and a pecky cypress ceiling opens to the family room offering panoramic water views and doors leading to the covered loggia. The sunlit family room has doors and windows to the north and east with expansive views of the water. Details include a high pecky cypress ceiling, a built-in media cabinet with a large television, Sonos system, Crestron and surround sound. Enjoy entertaining in one of the many amazing outdoor spaces. The covered loggia lives like an outdoor living room complete with a large stone fireplace, a spacious seating and dining area with spectacular water vistas.
. Beyond the covered loggia is an open terrace with a pool, spa, and more space for lounging and dining. In addition, there is a private lower deck with seating, which connects to the dock. A summer kitchen/outdoor bar is located on the east side. 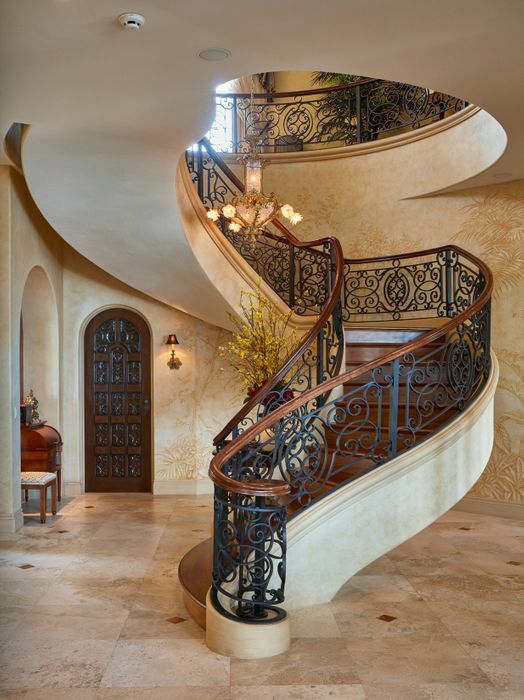 The grand spiral staircase, with an iron railing, leads to the second floor. An elevator is also available for added convenience. 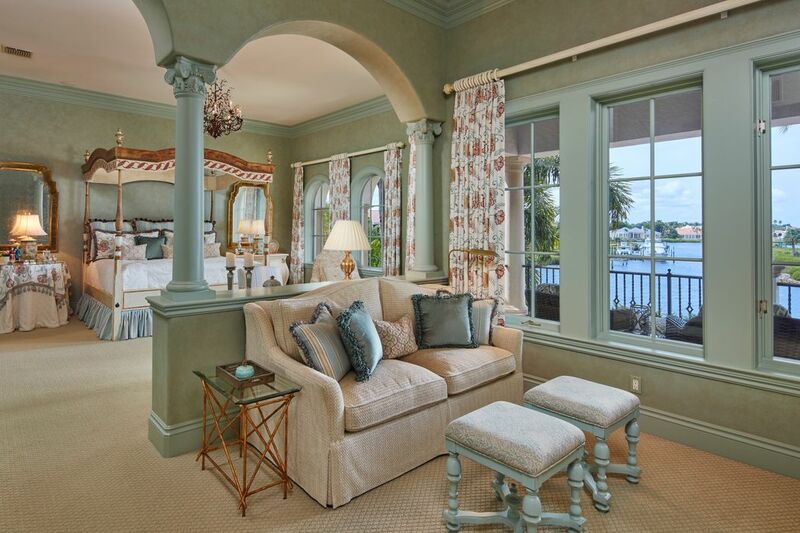 The master suite has Intracoastal views from the bedroom, sitting room, breakfast bar, office, and wrap-around balcony. 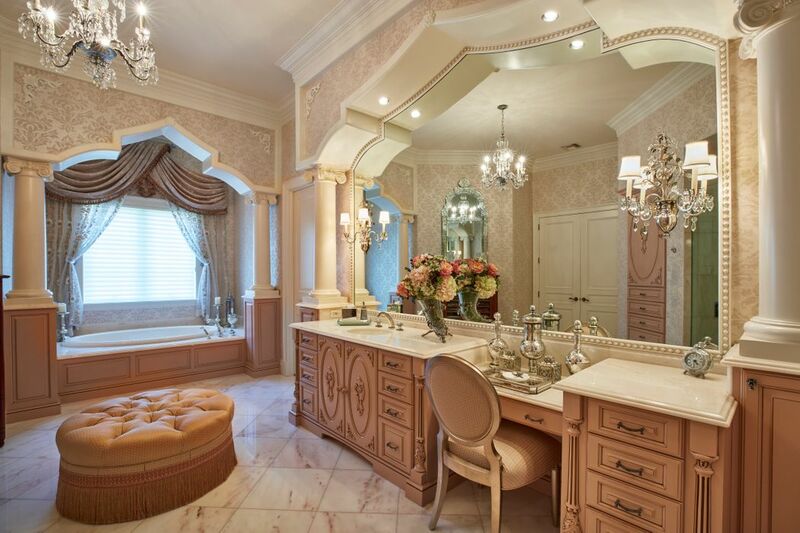 The suite also offers his and her baths, two large walk-in closets, and a shoe closet. Private master suite wrap-around balcony. 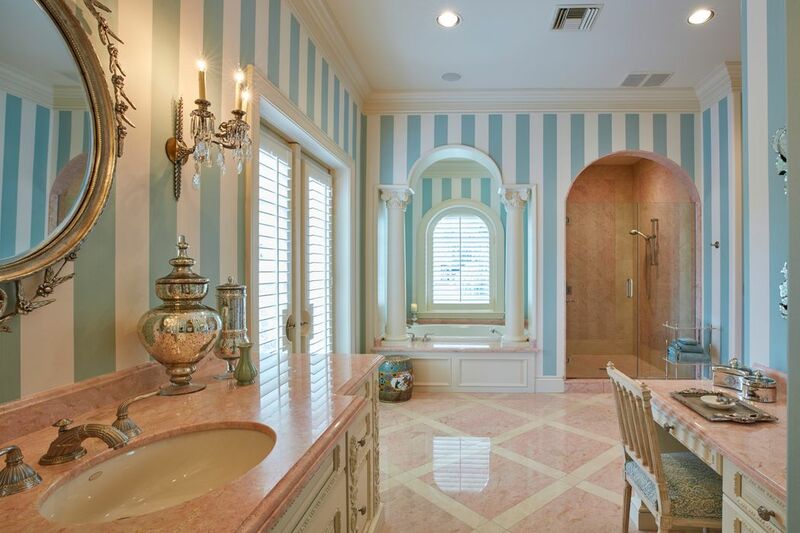 The premier guest suite has direct Intracoastal views, a sitting area, a private covered balcony, two walk-in closets, and an en-suite bath with vanity, Juliet balcony, a Jacuzzi tub and separate shower. 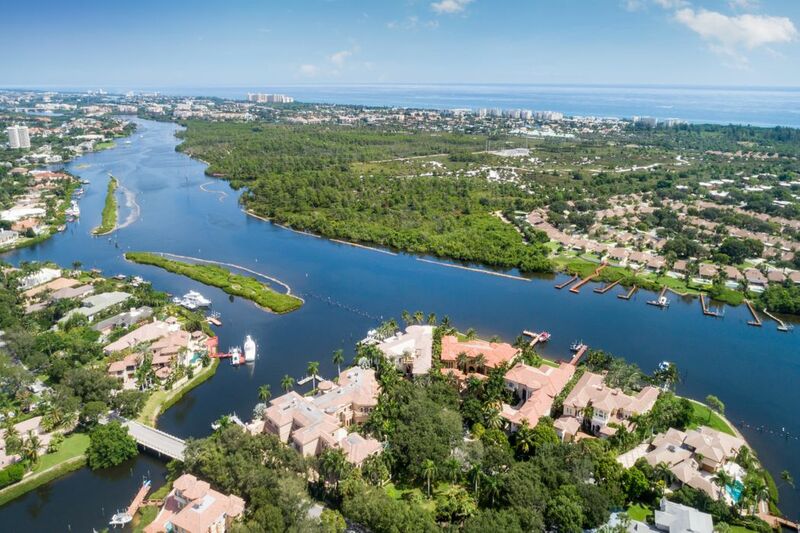 Admirals Cove has every amenity imaginable from 45 holes of golf, 2 driving ranges, 2 club houses, a marina, a gym, restaurants, a salon and spa, a new tennis complex with tennis and pickle ball courts, playgrounds, and much more. 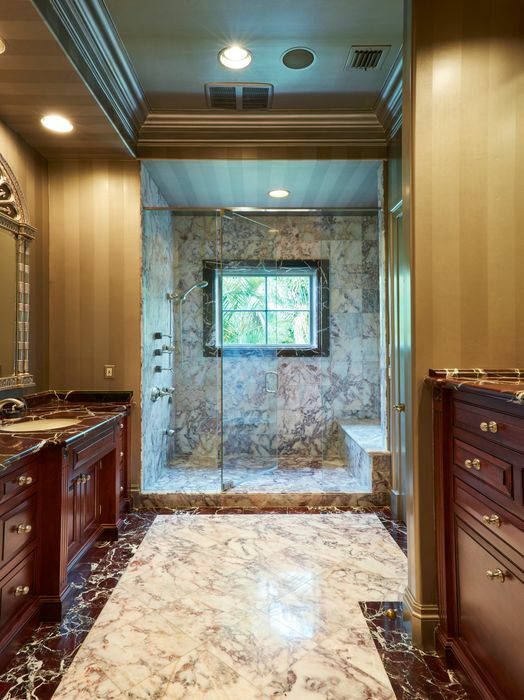 $13,900,000 5 Bedrooms7 Full / 1 Partial Baths11,974 sq. ft.